I haven’t posted in awhile (meaning a couple days, at this point). I think I’m very ADHD. I’m reading several books at the same time, and writing several books at the same time. I’ve gotten into the habit now of waking up at 4:30 a.m. Which is cool, except when I get jaw-cracking yawns around 7:30 p.m. when all I want to do is watch Community. Which leads me to clumsily segue into this show, which is like the greatest thing, ever. I cannot remember laughing so hard at anything, the Office included even in its glory years. I know this show is probably old news to most, but I’m always late for the train as far as pop culture trends go. My head is in the clouds most of the time, but when I’m not writing, I’m usually watching some form of TV, reading, or of course playing Skyrim. What do I love about Community? It’s very fresh. I just watched an episode in season three where there are seven different stories, each one based off how events would have gone if a die had rolled differently. Every year, there’s an infamous paintball episode, each one topping the last, and sometimes there are so many pop culture references going on that it is bewildering (in a good way). Then, there’s Chang. Don’t even get me started on Chang. Like any good show, Community has characters that I’ve absolutely fallen in love with. Each is extremely well drawn out, and it’s just such a good show. As a writer, all the subtle jokes that would slip by a lot of people are very cool. This is a show where the humor is very layered. You could watch episodes multiple times and still get new things out of it. I’m sure a lot of people, my friends included, already watch this show, but for some reason it hasn’t seemed to catch on to the forefront of popular culture, the way Downton is right now. It seems so surprising to me that I show this good is teetering on the edge of maybe not getting picked up again. This is good TV…like Arrested Development good. Maybe that’s what’s cursing it. I don’t know, but I’m hooked. I’m in season 3 and I think I’m going to have any issues catching up for when it starts up again in February. I’ll see the rest of you Communitees there. I’ve been posting (spamming, more like) about it often on Facebook and a bit on Twitter, but here are the numbers (as of 10:12 p.m., so there’s still a few hours left on the giveaway). This might sound a bit weird, but I was expecting a little more. A few blogs posted about it…nowhere as many as I thought. Then again, the download numbers might have been a bit lower without that promo, but for the most part it seemed the readers found the book on their own. By late afternoon yesterday, Night of the Necromancer was already in the top 10 in both free paranormal and free horror. Then again, who am I to complain? 1,885 is a large number of people to have your writing in their hands. I bet a lot of people don’t get as high on the lists as Night of the Necromancer got. This was the only screenshot I took, and it was taken probably late morning of Saturday 1/26/2013. 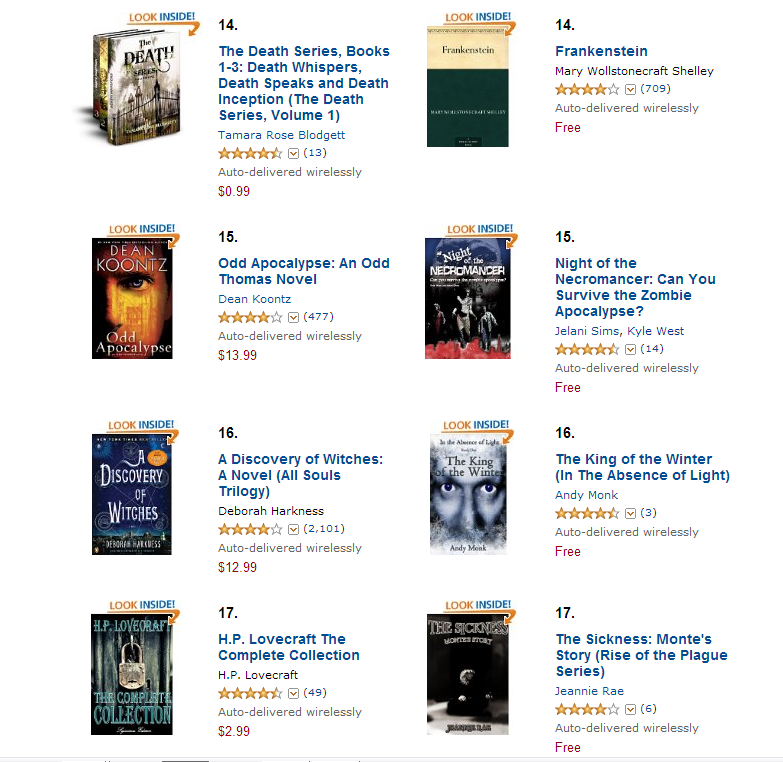 As you can see, this is Night of the Necromancer at #15 on the free horror column. The question, “is this working in getting my books more exposure?” It’s hard to say at this point, but it does seem to be working, at least in the short run. I can only hope that all these readers like my books enough to tell other people – which is really the point of the whole thing. I’ve been really encouraged by positive reviews on Apocalypse that seemed to come as a result of the promo, and sales have definitely spiked a little bit. There are always positive reinforcements going on, but right now I’m tired so it’s just hard to focus on them. I just want to say that it is really great to see some results after working hard, and I’m not just talking about the free promo, but the whole “operation build a platform” thing. It’s like I’m trying to push a heavy boulder – but hopefully once I get it started, it will be easier to keep the momentum going. I’m definitely, definitely a lot farther along than I was two months ago – even one week ago. There are at least 4,000 people worldwide who have read my name and have my books – that has to count for something. In a way, having people read my books, even if they are free, is a victory. It’s a lot of exposure, and a lot of eyes seeing something I created, something I worked very hard on, and in some cases poured my soul into. Trying to put yourself out there is tough, because people are inherently skeptical (as they should be) of an indie author, because there is so much that is bad out there. I think the coming weeks and next month will tell a more full story, but I’m hoping that this is enough to get a snowball rolling down the hill. It’s been exhausting, in a way. I’m a little burned out on promoting. It seems for the past two months I’ve done nothing but format, check for typos (not all of which I’ve found), submit to blogs, and plan my free days – among other things I’m sure I’m forgetting. I woke up at 9 this morning, and slept three hours this afternoon, and I’m still tired. I want to get back to the actual writing bit, which is the reason I’m doing this. I’ve sort of hit a bump with my fantasy novella – I’m having the usual crisis I always seem to have after a first draft, of believing that it’s horrible and stuff. I think maybe it is, but I might be able to fix it. It seems like a huge mountain at this point. I’m outlining book two of The Wasteland Chronicles, but am having trouble finding a way to keep the plot moving until the end. Those are questions for another time, however. After this, I’m going to take a break from promotion for a little bit. I’ll still post on this blog for sure. I know lately all my posts have been about writing, books, sales, blah, blah, blah, but hopefully I can get away from that for a while. I don’t want to lose the magic of writing and creating a story, which is the reason I do this, anyway. There’s still some time left on the giveaway, so if you’re reading this, hurry on over to Amazon and get your free copy of Night of the Necromancer. I’m starting to recognize a flow to the writing life. 1. Have a good idea for a book. Usually gotten from reading/culture at large, or personal experience. 2. Write about that idea. Develop characters, outline, whatever…just get a vague semblance of a plot in your head. 3. Usually at this point, I’m ready to begin writing. 4. Write every day. Finish the first draft as quickly as you are able, going no slower than a pace of 1,000 words a day. 5. When finished a month, or the latest two later, let the draft cool for a while. Get some distance. Write some other stuff. Promote other books (if you have any). Decide whether or not what you have written is worth sharing. If the answer is yes, line up a good cover artist and a good editor. You will need both. 6. Edit the book. Read it through fairly quickly – you’re allowed to fix mistakes as long as they don’t bog you down too much. Take note of the parts that are entertaining, which are slow, and which are downright painful to read. Delete the painful parts, and see if the slow parts can be improved. If not, delete. 7. Go back to the start and edit again. Take out everything that is not the story. Take out everything that gets in the way. Repeat as often as necessary (up to six or seven times). Add anything that is part of the story (usually, this is not much). 8. Copyedit. Check for typos, missed words, spelling. Make sure the formatting is correct and Kindle friendly. Create front copy. Begin to set your book up for upload. Meanwhile, line up four beta readers prepared to give you an honest opinion. Listen to their feedback, and make changes where appropriate. 9. Make sure everything is absolutely as perfect as you can make it, within reason: the text, the editing, the formatting, and the cover. When you are sure, come up with a killer blurb, upload the book. 10. Meanwhile (and you can start earlier than this step, especially if you already have relationships with book reviewers/bloggers), try to line up some reviews early for the book. As soon as it is online, promote the hell of it. Promotion is something I’m still learning, and is something I can improve at in all links in the chain. 11. Continue promoting all of your work however you can. Start a new story. Repeat steps 1-11. I may have missed a few things, but this is the basic gist. For me, it doesn’t stop when I’ve written the book. I want people to read it. Hopefully, I hope I can make enough for it to be a full time job. But I have to work for it. Also, for the first time Apocalypse broke the top 10,000 paid. It is the the top one percent of all paid books on Amazon. And Night of the Necromancer has gotten over 1,200 free downloads. Awesome. Thank you for your support. Night of the Necromancer – Free Weekend Giveaway! Alright, before I head off to work, I have an announcement to make. Night of the Necromancer, mine and Jelani Sims epic zombie survival choose-your-own-adventure novel, will be going free from Saturday 1/26 through Sunday 1/27. After over 2,000 copies of Apocalypse given away without any sort of advertising, I’m curious how well Necromancer will do, given that I submitted to many blogs weeks in advance letting them know about our free days. So, if there anyone out there who has not downloaded my book (because, you know, $3.99 is just way too much), then here’s your chance. It’s free, it’s version 2.0, and many typos and formatting issues were fixed to make it more professional. If you like zombies or choose-your-own-adventures, then you should love this book! Here’s to hoping to thousands of downloads! Normally this would the be the hour I write on my book, but I’m exhausted. I’m still trying to adjust to a new sleep schedule because I have to be at my new job at seven. I went to bed at 8:30 last night and probably couldn’t sleep till after midnight. Sleeping has always been hard for me. Half the time I’ll fall asleep fairly decently, but the other half of the time my brain won’t turn off. It wasn’t that bad last night because my brain plotted out a good portion of the second book of The Wasteland Chronicles, and I started getting really excited at the possibilities. Ultimately, if what I have in mind comes to the page, it will be better than Apocalypse, more mysterious, and much darker…and of course, the stakes will never have been higher. It’s hard to imagine getting any darker than Apocalypse, where my MC Alex deals with death and hopelessness galore (but he refuses to give up). Alex will deal with the same, only a greater scale in Origins. And this time, there is a hidden enemy that is very real that is trying to stop him. As he crosses the Wasteland to seek answers, it sort of becomes like the Odyssey, where myth starts intermixing with science in unexpected ways. 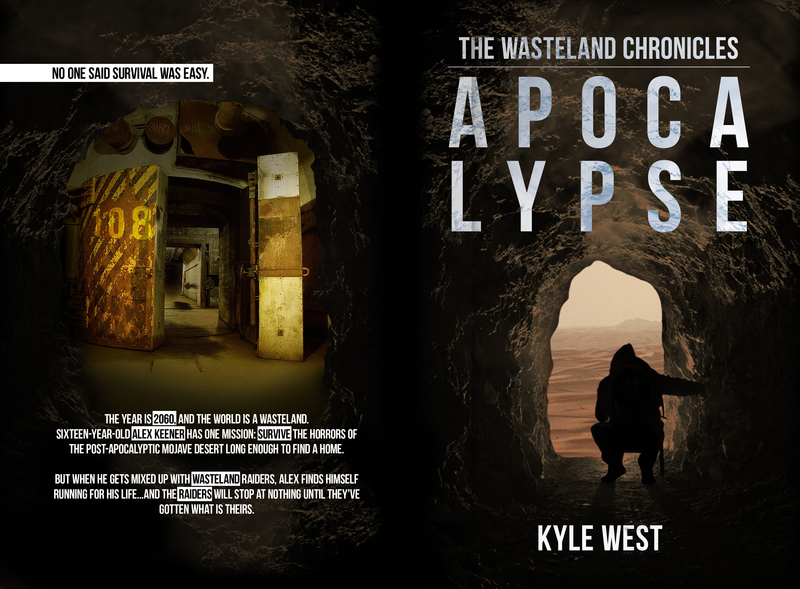 Like Apocalypse, Origins will be a book about finding hope in hopelessness. Originally, I never thought book two would be darker than book one. Apocalypse was plenty dark already, and I really wrestled with whether a certain character should be killed off in that one. In addition to the three heroes (or anti-heroes in some cases), the posse will be getting two new additions – Li (pronounced “Lie”), a stoic, female katana wielder who finds her life’s purpose in following a long dead samurai code, and Lisa, a passionate yet dangerous ex-raider who has it out for the MC. They will be journeying a thousand miles west, through harsh desert, twisted landscapes perverted by the xenovirus, meeting both friend and foe along the way…along with a mysterious, blind prophet who calls himself “The Wanderer,” a man born in the Old World who watched Ragnarok fall and saw his life burned up forever. And of course, answers will be provided at the end – the kind that will lead to more questions, setting the stage for book three and possibly a book four. These questions will be answered: what is the xenovirus? Where did it come from? Why is it doing what it’s doing? And can it be stopped? Some guesses people have made might be right…but so far, no one has guessed the whole truth. Well…that is somewhat my blurb. Probably much in there that won’t be in actual blurb (I like my blurbs short and snappy), but you get the drift. And of course any of this is subject to change at any moment. I haven’t even plotted an outline yet, although I am very ready to get started. I think I need to let my novella Dark Prophecies cool off for a bit. It’s too close, and I fear it may not be good enough. I tried to keep it simple, but too many things are going on in the 40,000 words that I’m going to have some lines to make the overall thing read well. In the meantime, I’m probably going to start on Origins soon. I just need a good night’s rest before I dive in, which will either be tomorrow or Saturday. My first published book was Night of the Necromancer, and my second was Apocalypse. But there is a book I wrote between those two that will never, ever, be published. This is my second book. This is the one I don’t want anyone to read…ever. Was it that bad? Er, no. Maybe. Most of it was written in the fall and winter of 2011, and it’s clear that I’ve gotten a lot better since then – which is great. So, what was so bad about this book that I say I will never publish it? Well…I got a little ambitious, and I’ve since grown in humility. Writing, like a lot of things, you have to learn to walk before you run. And I tried to run on baby legs. Maybe even fly. The result: a complicated mess that could barely get readers past the first chapter. Because, you see, I envisioned myself writing the War and Peace of the zombie genre. Ridiculous? Yes. If I had been eighteen and more naive, maybe I would have been crazy enough to pull if off. I had a grand total of six points of view going on. I remember the first draft being something like 90,000 words, but I ended up cutting a lot of it. I edited it. I tried to “reanimate” it, as it were. But this corpse of a book wasn’t gonna walk. Nanoswarm was a learning experience. One day, I might write that crazy, Cloud Atlas meets The Matrix meets War and Peace kind of novel, but that won’t happen right now. I’m still learning. I have to keep it simple. I have to actually research how nanotechnology works instead of just basing my knowledge on something I heard Michio Kaku say one time. Besides the plot problems and PoV problems, there were also character problems. I was unfair to some, while others were more well-drawn. Some of the things they say are downright laughable when I meant them in all seriousness. So young, so naive…alas. Some of these things don’t sound like a thing a human being would say, ever. It’s so weird how much we can grow in just a year and a month (which was when I saved the final draft of the book, n’er to return…). If this was me then, then I wonder where I’ll be in a year, especially now when I feel like I’m learning so much. If anything, it encourages me not to give up and keep trying. Maybe the writer’s adage of “getting a 1,000,000 words of crap” out of the way is true. We learn by doing. We become better writers by writing. We become better at anything by doing it (though naturally some will be more adept at picking it up than others – like any other skill. You could teach me all day about cars, but I will learn at one fifth the rate of a retarded fish). Then again, maybe Nanoswarm will hit e-book shelves sometime in my life. If it does, it will probably be an entirely new book, and I have no plans to do such a thing anytime soon. Probably by the time it does, zombies will be over. Then again, I thought zombies would be over by now, and they just won’t die (as zombies are wont not to do).